Aside from their growing differences over the impact of colleges and the news media, Republicans and Democrats remain far apart in their assessments of the effects of other institutions on the nation. Democrats continue to be more likely than Republicans to view labor unions positively (59% vs. 33%), while larger shares of Republicans have positive views of churches and religious institutions (73% of Republicans vs. 50% of Democrats) and banks and financial institutions (46% vs. 33%). Yet even as partisan divides in views of some of these institutions have widened in recent years, the public’s overall evaluations are little changed. Majorities of Americans say churches and religious organizations (59%) and colleges and universities (55%) have a positive effect. Nearly half (47%) say labor unions have a positive impact; 32% see their impact negatively. Views of the impact of banks and other financial institutions are more negative (46%) than positive (39%). And by roughly two-to-one (63% to 28%), more Americans say that the national news media has a negative than positive effect on the way things are going in the country. The survey finds that Republicans’ attitudes about the effect of colleges and universities have changed dramatically over a relatively short period of time. Among Republicans, there is an ideological gap in views of the impact of colleges and universities and other institutions: Nearly two-thirds of conservative Republicans (65%) say colleges are having a negative impact, compared with just 43% of moderate and liberal Republicans. The ideological differences are less striking among Democrats. Wide majorities of both liberal Democrats (79%) and conservative and moderate Democrats (67%) say colleges have a positive impact. However, Democrats are more ideologically divided than are Republicans over the effect of churches and religious organizations. Liberal Democrats are about as likely to say the impact of churches and religious organizations is negative (44%) as they are to say it is positive (40%). By two-to-one (58% to 29%), more conservative and moderate Democrats say churches have a positive than negative effect on the country. 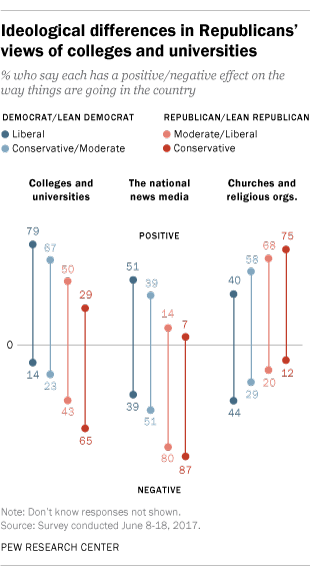 Majorities of both conservative Republicans and Republican leaners (75%) and moderate and liberal Republicans (68%) say churches and religious organizations have a positive impact. There also are pronounced ideological differences in views of the national media. On balance, more liberal Democrats say the national news media has a positive (51%) than negative (39%) impact on the country. Opinion among conservative and moderate Democrats is the reverse (39% positive, 51% negative). Among Republicans, negative views of the news media are shared by large majorities of both conservative Republicans (87%) and moderate and liberal Republicans (80%). Currently, Democrats are divided in their views of the effects of the national news media. Nearly half of Democrats and Democratic leaners say the news media has a negative impact on the country (46%) while about as many (44%) view its impact positively. This marks a major shift from just a year ago, when 33% of Democrats said the national news media had a positive effect and 59% said it had a negative effect. Republicans’ views of the news media’s impact are virtually unchanged from last year, but have grown more negative since 2010. Currently, 85% of Republicans and Republican leaners say the news media has a negative effect on the way things are going in the country, up from 76% two years ago and 68% in 2010. 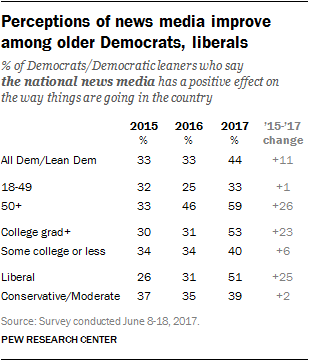 Among Democrats and Democratic leaners, there have been particularly pronounced improvements in assessments of the national news media among older adults, those with a college degree and liberals. Overall, 53% of Democrats with a college degree say the news media has a positive effect on the way things are going, up from 31% who said this in 2016 and 30% who said this in 2015. Among Democrats without a college degree, 40% view the media’s impact positively, up modestly from 2015 (34%). 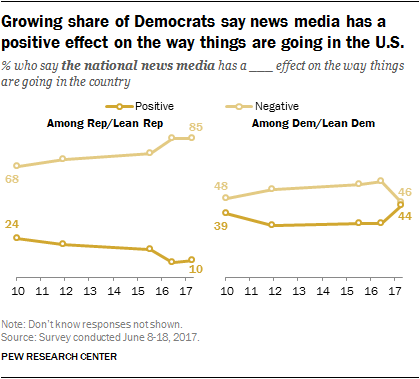 About half (51%) of liberal Democrats think the national news media is having a positive effect on the country these days; significantly higher than the shares who said this in either 2015 (26%) or 2016 (31%). By comparison, 39% of moderate and conservative Democrats say the media has a positive impact, little different than views over the past few years. 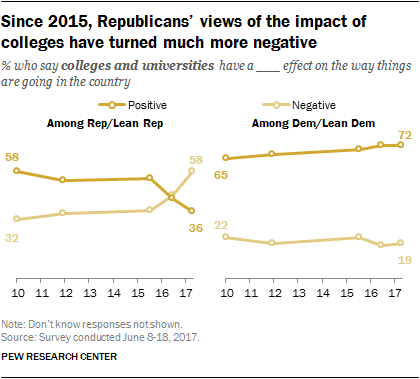 Over the past two years, the share of Republicans and Republican leaners who view the impact of colleges and universities positively has declined 18 percentage points (from 54% to 36%), and this shift in opinion has occurred across most demographic and ideological groups within the GOP. A closer look at Republican and Democratic views on the impact of colleges and universities reveals different demographic patterns within the two party coalitions. Among Republicans and Republican leaners, younger adults have much more positive views of colleges and universities than older adults. About half (52%) of Republicans ages 18 to 29 say colleges and universities have a positive impact on the country, compared with just 27% of those 65 and older. By contrast, there are no significant differences in views among Democrats by age, with comparable majorities of all age groups saying colleges and universities have a positive impact. Views of the impact of colleges and universities differ little among Republicans, regardless of their level of educational attainment. Democrats with higher levels of education are somewhat more positive than are those with less education, but large majorities across all groups view the impact of colleges positively. 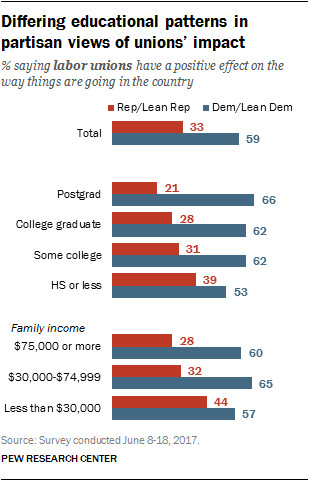 This pattern among Democrats also is seen across income categories: Wide majorities say colleges have a positive effect on the way things are going in the country, though Democrats with higher family incomes are somewhat more likely than lower income Democrats to say this. Among Republicans, nearly half of those with family incomes of less than $30,000 (46%) say colleges and universities have a positive effect, compared with only about a third (32%) of those with higher incomes. Democrats continue to be much more likely than Republicans to say that labor unions are having a positive impact on the way things are going in the country today (59% vs. 33%). Nonetheless, positive views among Republicans are up six points since 2016 and are above lows reached in 2010, in the wake of the economic recession. Views among Democrats are little changed in recent years, but also are more positive than they were in 2010. Democrats continue to be more likely to say banks are having a negative (54%) rather than positive (33%) impact on the country. Democratic views are somewhat more negative than they were in 2015 and little changed from one year ago. As a result, there is now a 13-point gap in the share of Republicans (46%) and Democrats (33%) who view the impact of banks and financial institutions positively; in 2015, there were no partisan differences in these views. Among Democrats, those with lower levels of education are less likely to view the impact of unions positively. Only about half of Democrats (53%) with no more than a high school diploma say labor unions have a positive effect on the country. Among Democrats with postgraduate degrees, two-thirds (66%) say this. By contrast, Republicans with less education are more likely than those with higher levels of educational attainment to see the impact of unions positively. Nearly four-in-ten Republicans with no more than a high school degree (39%) say labor unions have a positive effect, compared with just 21% of Republicans with a postgraduate degree. Public views of the impact of churches and religious organizations on the country have changed little in recent years. Currently, 59% say churches have a positive effect on the country, while 26% say they have a negative effect. The partisan differences in views of the impact of churches also have remained fairly stable: 73% of Republicans and Republican leaners say churches and religious organizations have a positive effect, compared with 50% of Democrats and Democratic leaners. Views of the impact of religious organizations also vary by education and religious affiliation. Among adults with a college degree or less education, majorities say churches have a positive effect, compared with about half of (48%) those with a postgraduate degree. Majorities across major religious denominations – including 80% of white evangelical Protestants, 66% of black Protestants and 61% of white Catholics – view the impact of churches positively. By contrast, only about a third of the religiously unaffiliated (34%) take a positive view. Views of churches’ impact also are much more positive among those who attend religious services at least occasionally than those who do not.